Teacher Netta's Notes - Spring! Happy first day of April! I can't believe how quickly the month of March flew by! Spring is underway especially with April showers later this week. While spring is warming up our temperatures outside, Teacher Jen and I have been preparing new spring works inside! 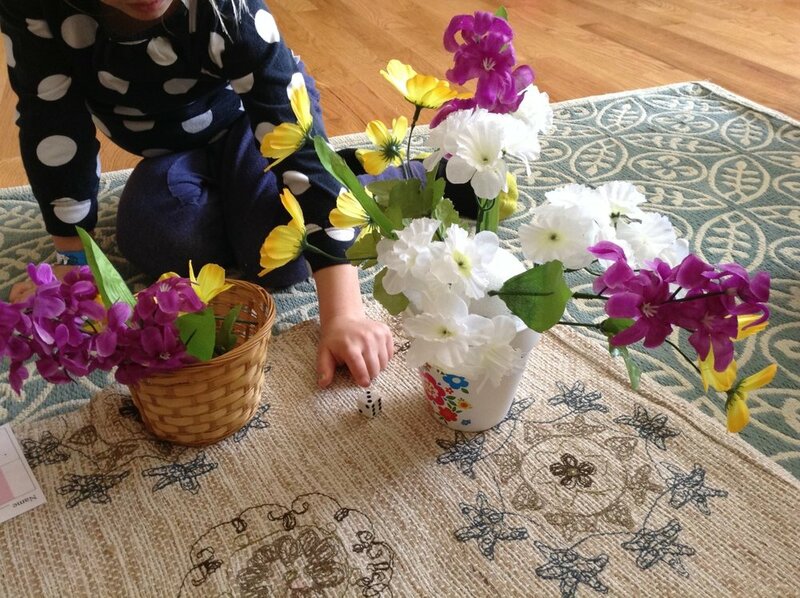 As seen in the pictures in this post, a new spring work involves flowers, math skills, and fine motor skills. The child completing this work rolls the dice and sticks the corresponding number of flowers into the Styrofoam ball in the planter. The math skills clearly come into play with the dice rolling portion of the work. We have now had a number of works that include a dice, so the students are getting used to the depictions of the numbers on the faces of the dice without having to count the dots. The students also have to use their 1-1 correspondence skills by counting each flower as they put them in the Styrofoam and make sure they put in the exact amount they rolled. 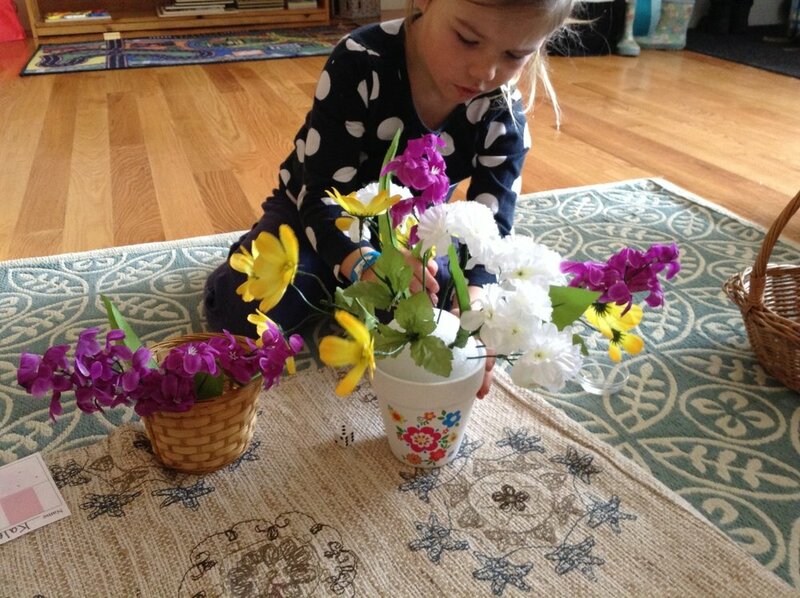 Fine motor skills are used when small fingers grasp each flower and use finger strength to push each flower into the Styrofoam. I showed the students how to hold the pot with one hand while sticking the flowers in with the other to keep their work calm and steady. I also showed them when taking the flowers out after their work was complete to also hold the pot with one hand so that their work stayed grounded. The kids are practicing some great body control and organization with this work! I have enjoyed watching what kind of arrangement the kids decide to place their flowers in! I've seen some spread them all out, some put all the same colored flowers together, and others put all the flowers close together. New spring activities are in the works and will find their way to our shelves very soon! Have a great week!